CHINA HAS TAKEN INTO CUSTODY 759 EAST TURKESTANI MUSLIMS TO MARTYR. THE UNITED NATIONS SHOULD BE ASSEMBLED IN URGENCY TO STOP CHINA THAT IS GETTING READY TO MARTYR THESE INNOCENT PEOPLE WITHOUT JUDGING THEM AND GIVING THEM THE RIGHT TO DEFENSE. The severe pressure and oppression that China executes in the East Turkestan continues in full speed for about 60 years. In the last 60 years a total of 35 million Uyghur Muslims were subjected to massacre, 796 UYGHUR TURKS WERE MARTYRED BY BEING PUT TO DEATH in the last month, TEN THOUSAND MUSLIMS WERE VANISHED IN ONE NIGHT, ONE HUNDRED THOUSAND OF OUR UYGHUR TURK SISTERS WERE TAKEN FORCIBLY FROM THEIR HOMES. These sisters of ours are forced to unlawful relationships on the pain of death. The consequence of the ten thousand Muslims that disappeared in one night is yet unknown. China should explain where the ten thousand Uyghur Muslims and our one hundred thousand Uyghur sisters are. The time has come for China to stop shedding blood. It is unworthy of China to constantly shed blood, ruthlessly oppressing people in the enforcement of violence and repression. IT IS A MUST THAT THE TURKISH-ISLAMIC UNION BE FOUNDED AT THE SOONEST TIME SO THAT THIS, THE WORST GENOCIDE IN THE HISTORY OF THE WORLD, CAN BE BROUGHT TO AN END AND FOR ALL FORMS OF OPPRESSION ACROSS THE WORLD TO CEASE. The states of the world must unite against this oppression, and international law must be enforced immediately. The Turkish-Islamic Union is the clear and certain solution, the salvation of East Turkestan, Palestine, Iraq, Afghanistan, the Crimea, Kirkuk and Moro. It is essential for the Turkish-Islamic Union to be established for the shedding of Muslim blood to stop, for the poverty in Islamic countries to come to an end, for the disorder, anarchy and terror in the Turkish Islamic region to be completely eliminated and for a peaceful, secure, prosperous and enlightened civilization to be built. It is impossible for a disunited Islamic world to protect Muslims from coming to harm. Only when the Muslim world, with its 1 billion or so population, will become one not a hair on the head of a single Muslim anywhere be harmed. Only in Turkey is there any condemnation of the repression taking place in East Turkestan. But if the Turkish-Islamic Union is founded and the whole of this enormous region condemns Chinese persecution, then that persecution cannot continue. The existence of the Turkish-Islamic Union will both eliminate all of China’s concerns and fears and also establish an environment in which not a single Muslim will suffer the slightest injustice and loss. The only way for China to prosper; to continue to exist without being repressed, alienated; without its economy be shaken; to have access to the energy sources necessary for its industry; and to become a respected state is not to pursue a policy based on violence. China can attain these goals only by the establishment of the Turkish-Islamic Union. The Turkish-Islamic Union will both protect the rights of Muslims who live in East Turkistan in the best manner and establish a secure environment in which Chinese and Uyghur Turks live together in peace and brotherhood. It will also contribute to the development and refreshment of China. It is obvious that an East Turkestan spiritually attached to the Turkish-Islamic Union will have a friendly contribution to China’s becoming a super-power. The Chinese administration should also recognize this fact. Unity lies at the heart of Islamic moral values. Allah reveals in the Qur’an, in the words “…If you do not act in this way (do not help one another and become friends) there will be turmoil in the land and great corruption.” (Surat al-Anfal, 73) that believers must be friends and allies, united and unified, for the corruption in the world to come to an end. The Turkish-Islamic world must demand this union. Failure to demand union means demanding division instead, and division is of no use to the Turkish-Islamic world. Muslims’ strength, power and best interests all lie in unity. It is time for the Turkish-Islamic world to become one. The unification of the Turkish Islamic world which is one in language, religion, tradition and beliefs is an urgent responsibility for all Muslims. The Islamic and Turkish world is waiting for this unification with great enthusiasm and eagerness. There should be no delay in this issue; the necessary steps should be taken at once. ]]>http://secretbeyondmatter.com/en/Announcements/16193/communist-china-is-spreading-terrorhttp://secretbeyondmatter.com/en/Announcements/16193/communist-china-is-spreading-terrorWed, 05 Aug 2009 15:10:01 +0300China must end its genocide of muslim Uyghur Turks and declare the whereabouts of the Uyghur Turks who have been forcbly taken awayThe time has come for China to stop shedding blood. It is unworthy of China to constantly shed blood, ruthlessly oppressing people in the enforcement of violence and repression. IT IS A MUST THAT THE TURKISH-ISLAMIC UNION BE FOUNDED AT THE SOONEST TIME IN SO THAT THIS, THE WORST GENOCIDE IN THE HISTORY OF THE WORLD, CAN BE BROUGHT TO AN END AND FOR ALL FORMS OF OPPRESSION ACROSS THE WORLD TO CEASE. The states of the world must unite against this oppression, and international law must be enforced immediately. LIFE IN EAST TURKESTAN CARRIES ON UNDER SEVERE PRESSURE AND OPPRESSION NOT SEEN IN ANY OTHER REGION OF CHINA. INCLUDING THE MASSACRES THAT HAVE TAKEN PLACE SINCE 1965, 35 MILLION UYGHUR TURKS HAVE TO DATE BEEN MARTYRED IN EAST TURKESTAN. THIS IS AN UBELIEVABLE FIGURE. THE GENOCIDE AGAINST THE UYGHUR TURKS IS STILL CONTINUING AT FULL SPEED TODAY. UYGHUR TURKS ARE FORCIBLY REMOVED FROM THEIR HOMES AND EXECUTED EN MASSE IN CONTRAVENTION OF INTERNATIONAL LAW. IN THE LATEST INCIDENTS, A TOTAL OF 796 UYGHUR TURKS WERE EXECUTED, 196 IN PUBLIC, 600 IN SECRET, ON THE BASIS OF NO LEGAL JUSTIFICATION AND WITHOUT BEING PERMITTED TO PRESENT A DEFENSE. IN ONE NIGHT IN EARLY JULY, 2009, 10,000 MUSLIM UYGHUR TURKS DISAPPEARED. WHERE ARE THESE PEOPLE NOW? IF THEY HAVE BEEN MARTYRED, WHICH IN ALL LIKELIHOOD THEY HAVE, THEN AN UNBELIEVABLE SLAUGHTER IS STILL GOING ON. THERE ARE THOUSANDS OF UYGHUR TURKS WHOSE AFTERMATH IS A MYSTERY. ONE HUNDRED THOUSAND OF OUR UYGHUR TURK SISTERS HAVE BEEN FORCIBLY REMOVED FROM THEIR HOMES. THESE SISTERS OF OURS ARE FORCED INTO UNLAWFUL RELATIONSHIPS ON THE PAIN OF DEATH. THE CHINESE GOVERNMENT MUST EXPLAIN WHERE THESE 100,000 UYGHUR TURK SISTERS HAVE BEEN TAKEN. China must put an end to its policy of oppression and repression. The Turkish-Islamic Union needs to be founded as a matter of urgency if our Muslim brothers in East Turkestan are to enjoy security and if China’s own citizens are to live in peace. The establishment of the Turkish-Islamic Union will mean the salvation of both East Turkestan and China. This union will protect the rights of the Muslims living in China in the finest manner, will create an environment in which both Chinese and Uyghur Turks can live together in peace as brothers, and will also contribute to the development and strengthening of China. The Turkish-Islamic Union is a union of love. It is a union of affection, a union of hearts. The bases of this union are love, altruism, helping others, compassion, tolerance and understanding. The aim of the union is also to achieve the highest levels in respect for human beings and in art, science and technology. Once the union is established, not just Turkish societies and Muslims, but the whole world, will attain enlightenment. We cannot count on the recent events by saying “what happened has happened”. We cannot keep silent by saying, “those people were executed, our young girls were abducted and the case has been closed”. This implementation has been taking place in China for such a long time. East Turkestani Uyghur Turks have been living under oppression and this tyranny has been perpetual. THIS IS AN EXPLICIT CRIME AGAINST HUMANITY. THIS GENOCIDE NEEDS TO BE HALTED RIGHT AWAY AND THESE ACTS SHOULD BE BROUGHT TO ACCOUNT. HAGUE TRIBUNAL SHOULD TAKE CHARGE OF IT, CRIMINALS SHOULD BE ARRESTED AND PUNISHED ACCORDING TO THE INTERNATIONAL LAW. 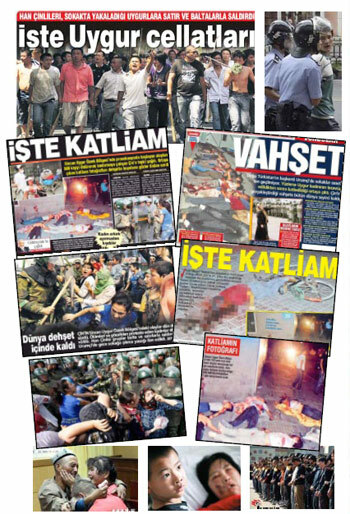 These executions, violence and injustice will continue as long as the Turkish-Islamic Union is not established. In a world in which the Turkish-Islamic Union exists, it is impossible for China to engage in such a merciless practice without recognizing the International Law. The Turkish-Islamic Union will both protect the rights of Muslims who live in East Turkestan in the best manner and establish a secure environment in which Chinese and Uyghur Turks live together in peace and brotherhood. It will also contribute to the development and refreshment of China. The Turkish-Islamic Union is a union of love. It is a union of affection, a union of hearts. The bases of this union are love, altruism, helping others, compassion, tolerance and understanding. The aim of the union is also to achieve the highest levels in respect for human beings and in art, science and technology. Once the union is established, not just Turkish societies and Muslims, but the whole world, will attain enlightenment. For more than a century Muslims all over the world have been living under repression. As a result of conflicts, disorders, repression and cruelty in the Turkish-Islamic zone thousands of innocent Muslims have lost their lives, tens of thousands became permanently disabled, millions of them were deported from their homes and countries, and many others were arrested only because of their beliefs and ideas. Today in Palestine, Iraq, Afghanistan, East Turkestan, Moro and various other Islamic countries ruled by repressive administrations this vi olence is going on with all its intensity. Lately in East Turkestan a total of 796 Muslims—600 of them concealed—were executed without specifying any grounds. These executions, violence and injustice will continue as long as the Turkish-Islamic Union is not established. In a world in which the Turkish-Islamic Union exists, it is impossible for China to engage in such a merciless practice without recognizing the International Law. Terrorist activities in the Turkish-Islamic zone will be totally eradicated, and those who incite terrorism will find themselves confronted by the highly deterrent army of the Turkish-Islamic Union military pact. The unitary structures of the states comprising the union will be maintained. Laicism will be one of the fundamental principles of the union. For that reason, both Muslims and non-Muslims will be able to live in security under the same strong roof. The Turkish-Islamic Union is a union of love. It is a union of affection, a union of hearts. The bases of this union are love, altruism, helping others, compassion, tolerance and understanding. The aim of the union is also to achieve the highest levels in respect for human beings and in art, science and technology. Once the union is established, not just Turkish societies and Muslims, but the whole world, will attain enlightenment. Turkish-Islamic Union is a unity of decency. This unity is not a fanatic, repressive unity that oppresses. It will provide security to nations both gathering under this flag and of the entire world. The Turkish Islamic world’s being under such a rational, responsible and just leadership will benefit both the 1.5 billion Muslims and all the other people in the world. Since the time of our Prophet (saas) Muslims have led humanity in the spheres of wisdom, science, thought, arts, culture, civilizations, and established giant works for the good of the humanity. The Turkish-Islamic Union will lead the 21st century in being an age of real enlightenment. In the idea of the Turkish-Islamic Union there exists freedom of thought and expression. People of all thoughts and faiths can express their opinion without being under any repression and hardship. The rights of these people are protected and everyone’s thought is welcomed with tolerance. In the leadership of the Turkish-Islamic Union Muslim communities will become the kind of communities in which people will respect one another’s opinions. Equality, justice and freedom will dominate, cruelty and injustice will entirely be eliminated. The Islamic world will not only secure Muslims’ peace and security but also become the leader of culture and civilization in the world. The enlightenment which will accompany the Turkish-Islamic Union will offer beauty to the entire world. USA, Russia, China, Israel and all the European states will witness the solution of long-lasting, deep-rooted problems all of a sudden and everyone will benefit from this. All the concerns of big states remaining outside the Turkish-Islamic world related to security, economy and cultural values will be entirely eliminated with the establishment of this unity. Struggle against terrorism will come to an end, the risk of cultural conflicts will entirely be eliminated, all people will benefit from underground resources and raw materials in the best way, economy will attain stability, the possibility of crisis will be eliminated, the budget allocated to military expenses will be spent for better and securer lives for people to lead. It is obvious that the existence of a strong Turkish-Islamic Union is to the benefit of all nations. ]]>http://secretbeyondmatter.com/en/Announcements/15539/the-turkish-islamic-union-ishttp://secretbeyondmatter.com/en/Announcements/15539/the-turkish-islamic-union-isTue, 21 Jul 2009 19:39:24 +0300Only the Turkish-Islamic Union Can Halt the BloodshedThe persecution in East Turkestan over the last week is not the first that our Muslim brothers have been confronted by. Our East Turkestani brothers have been subjected to all kinds of maltreatment for the last 60 years and live under unbelievable repression. Muslims have been slaughtered in Palestine for some half a century. They live the lives of exiles in their own land. Reports of deaths flood in from Iraq on an almost daily basis. Our Kirkuk brothers live in constant fear of death. Muslims in Crimea are trying to survive under the harshest of conditions. The blood of Muslims is shed almost every day in Afghanistan, and thousands of Muslims have become refugees in their own country in Pakistan. Only recently, Bosnian Muslims were subjected to ruthless genocide in the heart of Europe, before the very eyes of the world. Prisons in many countries are full of Muslims arrested because of their ideas and faiths. These sufferings, killing, troubles and woes are nothing new. Muslims have been ruthlessly oppressed for around a century now. This corruption and bloodshed can be brought to an end only by the establishment of the Turkish-Islamic Union. The Turkish-Islamic Union is the clear and certain solution, the salvation of Palestine, Iraq, Afghanistan, East Turkestan, the Crimea, Kirkuk and Moro. It is essential for the Turkish-Islamic Union to be established for the shedding of Muslim blood to stop, for the poverty in Islamic countries to come to an end, for the disorder, anarchy and terror in the Turkish Islamic region to be completely eliminated and for a peaceful, secure, prosperous and enlightened civilization to be built. It is impossible for a disunited Islamic world to protect Muslims from coming to harm. Only when the Muslim world, with its 1 billion or so population, will not a hair on the head of a single Muslim anywhere be harmed. Only in Turkey is there any condemnation of the repression taking place in East Turkestan. But if the Turkish-Islamic Union is founded and the whole of this enormous region condemns Chinese persecution, then that persecution cannot continue. It is not the burning of Chinese goods that will put a stop to Chinese repression. Experience shows that such measures produce no results. The only way to achieve results is the foundation of the Turkish-Islamic Union. A united Turkish-Islamic world will be an extremely deterrent and effective force. The Turkish-Islamic Union will ensure full freedom of worship, belief, opinion and expression. Members of all faiths will be able to worship as they wish, to visit all the sacred sites of their faith, and the goods, lives and honor of people of whatever opinions or beliefs will be guaranteed by the Turkish-Islamic Union. Unity will bestow a huge power on the Turkish-Islamic world. When the Turkish-Islamic world is united, there will be no possibility of Muslims being persecuted, denigrated, oppressed are slaughtered, and such things will never even cross anyone’s mind. With the founding of the Turkish-Islamic Union, America, Europe, China, Russia, Israel and in short the whole world will breathe easier. Terror will come to an end, distribution of raw materials will be guaranteed, the economic and social order will be protected and cultural conflicts will disappear entirely. America will no longer have to send troops to lands thousands of kilometers away, Israel will no longer live behind walls, the countries of the EU will encounter no economic barriers, Russia will have no more security concerns and China will have no trouble finding raw materials. The Turkish-Islamic Union will cause regeneration throughout the Muslim world. Thanks to the Islamic common market to be set up, products from one country will be easily marketed in another, without becoming caught up in quotas or national frontiers. Trade zones will grow, all Muslim countries will enjoy an increase in market share, exports will rise, leading to an acceleration of industrialization in Muslim countries, and economic development will lead to technological advances. A Turkish-Islamic world with a powerful economy will be a major cause of prosperity for the Western world and other societies. These societies will find a power with which they can co-operate and engage in mutual trade with no feelings of concern. In addition, the funds that Western institutions and organizations constantly pour in for the region to regenerate will no longer be required, and these funds will be used to strengthen the global economy instead. There is no obstacle to the establishment of the Turkish-Islamic Union. All that is needed is the will to unite. This union must be genuinely desired, and Muslims must treat one another with love, understanding, humility, affection and compassion, never forgetting the fact they are all brothers. History shows that permanent peace can be brought to both the Middle East, the Balkans and the Caucasus under Turkish leadership, as the heir to the Ottoman legacy. The Turkish-Islamic Union to be established under the leadership of Turkey will mean an end to the conflicts and bring peace to the region. This union will also lead to wealthy and prosperous communities as all the countries of the region will engage in powerful economic cooperation. Like that of the Ottomans, the Turkish-Islamic Union’s approach to the Balkans, the Caucasus and the Middle East will take the form of a structure that embraces different ethnic identities and faiths. The foundation here is the rediscovery of Turkish-Islamic culture and our long established Civilization. Indeed, in cultural if not political terms, Turkey still dominates the region, with many Muslims in the Balkans and the Caucasus in particular referring to themselves as Turks and Ottomans, despite their different ethnic origins. The Ottoman Empire no longer exists, but its legacy, Turkish-Islamic culture and civilization still stretches from one end of the Balkans to the other. The 10 million Balkan Muslims live along a line stretching from Edirne to Bihac. Furthermore, some have been holding out along that line since 1878, and others since 1912. Their sole hope is the reconstruction of the hold peace, security and stability, a powerful union… That union is the Turkish-Islamic Union. That same longing also applies to the Middle East. Many parts of the region used to belong to us. The people of the region have a great love for Turkey. Regions such as Kirkuk, where our relatives the Turkmen live, are also vitally important for us. Had international laws and the wished of the people of the region been observed after the War of Liberation, then Mosul, Kirkuk and the surrounding area, known as Northern Iraq, would today be a part of Turkey. This is a known fact that must never be forgotten. That is why former Turkish territories such as Kirkuk, Crimea and Bosnia have such profound ties to the Turkish nation, ones they will never renounce. Together with our cousins who returned to the Crimea in the wake of the collapse of the Soviet Union, there are today some 300,000 Turks in the region. It is a known fact that more than 500,000 Crimean Turks were forcibly expatriated and unable to return to their homes from exile, mainly from Uzbekistan, Tajikistan and Ukraine. Existing bureaucratic obstacles to a return to Crimea and the economic weakness of the region do not allow the Crimean Turks the opportunity to return to their homes. The “Ottoman land” made up of the Balkans, the Middle East and the Caucasus, and with Turkey at their center, still have a very lively and complex structure. The gap that emerged in the wake of the Ottoman Empire has still not been filled and no climate of security has been fully established. This attracts the attention to the Muslim Turkish nation that applied the “model of co-existence” under Ottoman leadership. And this shows that this model can only be applied today and tomorrow by the Muslim Turkish nation. Indeed, many politicians, political scientists and writers and researchers have been examining this just system of administration established with great success by the Turkic states, and the Ottoman Empire in particular. History shows that permanent peace can be brought to the Middle East, the Balkans and the Caucasus under the leadership of Turkey, as the heir to the Ottoman legacy. The Turkish-Islamic Union to be established under Turkey’s leadership will put an end to the conflict and establish peace in the region and will also produce wealthy and prosperous communities as all the countries of the region engage in powerful economic cooperation. The most powerful military, political and economic model for the states of the region is one in which they combine their forces instead of engaging in conflict. A common foreign policy will make these states an enormous political force. By Allah’s leave, this will become a reality with the formation of the Turkish-Islamic Union. ]]>http://secretbeyondmatter.com/en/Announcements/14910/the-turkish-islamic-union-ishttp://secretbeyondmatter.com/en/Announcements/14910/the-turkish-islamic-union-isWed, 01 Jul 2009 11:41:12 +0300The Solution to the Kirkuk Problem is the Turkish-Islamic UnionTurkey has a historic duty to protect an innocent people who share the same origins and beliefs and who speak the same language. The peace and prosperity of our Turkmen brothers is a historic, moral and political responsibility for Turkey. This can be brought about through the establishment of the Turkish-Islamic Union. In order to bring peace to reign in a region experiencing troubles and suffering, steps toward the foundation of the Turkish-Islamic Union must be taken without delay. The Turkish-Islamic Union is also essential and indispensible for the peace, liberation and happiness of all Muslims in Iraq. The territory of Mosul was given to the newly founded Republic of Iraq at the end of the First World War, in violation of international law and disregarding the wishes of the people of the region. The fact is that if the historical, geographic, political and cultural evidence submitted by Ismet Pasha at the Lausanne Conference had been considered objectively, if international laws had been applied, and if the referendum demanded by the people of the region and Turkey had been carried out, then these lands would have become part of Turkey. This is a known fact, one that must not be forgotten. This does not, of course, mean the re-acquisition of Northern Iraq. The leaders of the Turkish state and the senior command of the Turkish Armed Forces who are totally devoted to the great leader Ataturk’s principle of “Peace at Home, Peace in the World,” have many times set on record that Turkey has no aim or intention of occupying Northern Iraq. However, Turkey cannot ignore the sufferings and difficulties of its relatives living in those lands, nor, of course, of all the other communities. Ensuring the security of our Turkmen brothers, who have been ignored by the foreign powers for some 90 years and whom Iraqi administrations have attempted to assimilate is a moral responsibility for Turkey, the heir to an empire that ruled the region for hundreds of years. Our Turkmen brothers must have an equal say in the administration of the country, must be able to do business as they wish, must live their daily lives in full possession of all rights, must be able to worship freely and use their own language and, most important of all, must be sure that their lives and possessions are safe. All the peoples of the region suffered enormously under the Saddam administration. Not just the Turkmen, but also the Kurds, Sunni Arabs and other people all suffered grave losses and lived in fear and terror. There is a lesson to be learned from this historic suffering. An opportunity has arisen for all the peoples of the region to live in peace and security. Policies that trample on rights, laws and good conscience as one community attempts to crush and disregard others are unacceptable in the face of this opportunity to reconstruct in a framework of truth and justice. The bloodshed in the region can be stopped and the peace that reigned throughout the Ottoman period can be re-established through the foundation of a union based on love and brotherhood in the area. What happened in the past must be left in the past and all communities must act in a spirit of reconciliation and tolerance if a bright future is to be built. The peoples of the region share the same historical and cultural values and the same beliefs, and must approach one another with understanding, respect and love, and be one another’s protectors and defenders, rather than enemies and foes. Allah has revealed in the Qur’an that Muslims are one another’s brothers. Certain cultural differences between Muslims must be regarded, not as elements of division, but on the contrary as a diversity and wealth that enrich society. And these cultural differences must not be made the basis of conflict. Allah commands Muslims to “Hold fast to the rope of Allah all together, and do not separate.” The Kurds, Arabs and Turkmen living in the region must never ignore these facts. Turkey must embrace the region by combining its traditional peaceable foreign policy and the “Ottoman vision” bestowed on it by history, thus winning over the whole people of the region and uniting them around a common value, and initiating a “cultural policy” and economic leap forward that will ensure they look at Turkey sympathetically. A strengthening of the cultural and commercial ties that already exist in the region, the prevention of instability and disorder and winning over the hearts and minds of the people of the region must form the basis of Turkey’s “Mosul-Kirkuk Policy.” The most important way of bringing all this about is the immediate foundation of the Turkish-Islamic Union that will protect the unitary structure of all states and guarantee, under a laic system, freedom of religion and ideas of all peoples under Turkish leadership. ]]>http://secretbeyondmatter.com/en/Announcements/14909/the-solution-to-the-kirkukhttp://secretbeyondmatter.com/en/Announcements/14909/the-solution-to-the-kirkukWed, 01 Jul 2009 11:31:04 +0300The Communist Threat Must Not Be Underestimated! Turkey is about to be brought face to face with the greatest communist uprising in history. The communist, separatist movement still active in the Southeast of the country in fact consists of an intermediate stage of a giant plan. That plan involves not just one specific region of Turkey, but the entire country. In the event that the strategies aimed at dividing the country are successful, this will immediately be followed by an action to turn the whole of the motherland communist; the ultimate objective is a communist Middle East. Once an atheist, communist Middle East has been brought about, Israel will be set at war with the countries in the region, and a plan to "destroy the Middle East" will be set in action. At the end of this planned Armageddon only Israel will be left. The final stage of the plan is the destruction of the Israeli people. This is the plan of the Dajjal (the Antichrist). Darwinism is the world's most perverted faith. Savage capitalism, communism and fascism are Darwinist sects. Freemasonry is these sects' largest cult world-wide. - The Plan of the Antichrist can be defeated only if the sinister plots aimed against Turkey and the Middle East are opposed by an anti-Darwinist, devout, positive patriotic system based on brotherhood and that attaches importance to matters of faith. This major intellectual, humane and religious struggle will be waged by the great Turkish Nation. Historical truths, the elevated character and faith of the Turkish People will constitute a perfect role model for this struggle. - Turkish youth must be made conscious about communism, materialism, Darwinism, savage capitalism, Freemasonry and chauvinist Zionism. Nongovernmental organizations engaged in this must be supported by the state. And the state must be made to develop a rational and transparent policy in this regard. Against the Darwinist-materialist education, young people in universities and high schools must be given a rational education, based on the true facts and the deceptions of Darwinism must be made set out, again on the basis of scientific proof. - The separatist terrorist organization is active not just up in the mountains, but also among the public. The organization is infiltrating itself among the people and engaging in systematic materialist and communist propaganda, because communist militants are perfectly well aware that they have no chance of success in a society that has adopted Islamic moral values. This activity is far more dangerous and could have far worse consequences than that up in the mountains; because people in the East of Turkey lack sufficient information about Marxist-Darwinist thinking and the harm that this inflicts. Unless precautions are taken without loss of time, every day even more of our young people will be taken in by the communist separatist group's indoctrination. The consequence of a young generation subjected to Darwinist education, rather than an obedient and qualified one that knows the importance of love for human beings, moral values, affection and compassion, is social collapse. The first step taken in order to gather support for such inhuman ideologies as communism is the imposition of Darwinist claims that "man is a kind of animal, the product of nature and chance." Faithfulness, loyalty, affection and self-sacrifice have no place in Darwinist societies; concepts such as religion, family, nation and the flag are meaningless. The separatist organization first of all teaches the people it will raise as terrorists about dialectical materialism, and Darwinism, the basis of that philosophy. Therefore, Marxist-communist terror can be prevented through an effective and determined intellectual struggle and propaganda. There are those who wish to destroy Turkey through communist terror. The solution is the elimination of the foundation of communism; and that foundation is Darwinism. - People in the East of Turkey have excellent and exemplary moral values. They are decent, concerned with character and honor, contented with what they have and are humane and loyal to the state. They are hospitable to the extent of offering their best food to guests, and are loyal and full of love. Most Anatolian people have such a noble character. It is the duty of the state to protect these citizens and provide intensive support for those who require it. The threat of terror hinders the construction of new, modern and vitally important facilities, and denies the possibility of new investment. For that reason, people in the East not only live under the shadow of terrorism, but are also exposed to the grave economic difficulties caused by it. What the state needs to do at this point is to engage in a new policy and attach primary importance to meeting the needs of its Eastern people in such specific areas as food, clothing, housing and health. In addition, the support given to agriculture and livestock must be increased in order to revitalize the economy of the region, and the people living there must feel the pride and happiness at being select members of the Turkish Republic. Once the state literally makes its affection felt, many problems will easily disappear; the communist, separatist terrorist organization's propaganda will lose all influence, and its snares will fail. Those engaged in warning the Turkish nation against Darwinist lies and in striving to neutralize the destructive impact of these deceptions have for long been the target of materialist circles. The Turkish Nation rejects Darwinism, materialism and the ideologies stemming from them, and maintains its faith in God. So long as this continues, it will be impossible, by God’s leave, for those plotting against the country to succeed in their aims. Aware of this, certain forces are striving with all their might and main to turn the nation away from faith and moral virtue, and to impose their Darwinist worldviews. The greatest obstacle to these endeavors is the works of Harun Yahya, consisting of books, web sites and documentaries, and the conferences held by the Science Research Foundation. There has been an immense movement of faith, patriotism, culture and science in Turkey ever since the 1980s. Thanks to this, Turkish youth have been saved from sliding towards atheistic and separatist ideologies by adhering to national and spiritual values. It is for these reasons that the materialist-Darwinist mentality that determines Europe’s social and political course has named the Turkish believers as a serious threat to it. In order to overcome this, they have planned new strategies to put an end to the activities of Harun Yahya (Adnan Oktar) and the Science Research Foundation, which European materialist communities regard as the major obstacle to the spreading of separatist, atheistic and materialist ideologies in Turkey in order to damage its indivisibility and national unity. As in the past, attempts are being made today to realize these plans by means of such methods as pressure, threats, intimidation, plots and false witnesses, and with the support of Sabbatean forces ready and waiting in Turkey and of some sections of the media. The Turkish Nation has already witnessed such strategies, and possesses the foresight with which to distinguish between friend and foe, between patriots and those concerned only with their own interests. “They must arm themselves as best they can (rifles, revolvers, bombs, knives, knuckle-dusters, sticks, rags soaked in kerosene for starting fires, ropes or rope ladders, shovels for building barricades, pyroxylin cartridges, barbed wire, nails, etc., etc.). . .
Raised in the light of Marxist-Leninist ideas constructed on Darwinism and Lenin's terror directives, separatist militants slaughter Turkish soldiers, police officers and innocent civilians, and resort to all forms of terror. People holding Darwinist-Marxist views in Europe and other parts of the world cannot be expected to oppose terrorism. That would be a violation of the spirit and logic of Marxist philosophy. Messages of condemnation and warning are of no concern to such people. They regard Darwinist-Marxist terrorists as "revolutionary forces fighting against feudalism." They respect the memories of terrorists such as Ho Chi Minh, who have gone down in history as responsible for terrible bloodshed. The Vietnamese guerrilla leader Ho Chi Minh (1890-1969) was a confirmed Marxist-Leninist and Darwinist. The guerrilla tactics employed in Southeast Turkey by the separatist, communist organization are all an application of the methods employed by this fanatical communist leader. If Darwinist-materialist education is made compulsory, communist-Darwinist terror will be inevitable. Turkey was saved through a last-minute intervention when communist terrorism between 1971 and 1980 was about to engulf it. Once again, a Darwinist-communist, terrorist uprising is now methodically laying siege to the country. The fundamental target of the communist uprising, which has selected the Southeast of the country as its base of operations, is first Turkey, and then, at a later stage, the whole of the Middle East. Effective surveillance, effective arrests, effective sentencing and effective punishments are no solution. Severing logistics and sources of income, and cross-border operations, are not measures that can lead to permanent results. They can only provide a temporary decline, because communist terrorism has no homeland. A communist has no homeland. Communism targets the whole world, for which reason the most effective weapon against communism, which employs all the world's means by means of global solidarity, is intellectual struggle. This is only possible through anti-Darwinist, anti-materialist scientific activity. That will dry up the swamp. Swatting mosquitoes individually has never represented a solution at any time. Political, bombastic and heroic-sounding speeches merely feed and hone terrorism. Bringing people down from the mountains to communist propaganda is heedlessness. Without losing any time, support must be given to voluntary organizations in this sphere, and this disease, what is true and what is false, must be laid out in co-operation with the state. The total number of works written by Adnan Oktar, under the pen-name Harun Yahya, is around 250. These books consist of 46,000 pages and 31,500 illustrations, of which 7,000 pages and 6,000 illustrations are concerned with the collapse of the Theory of Evolution. You can read all the books written by Adnan Oktar under the pen-name Harun Yahya free of charge on the www.harunyahya.com, and www.harunyahya.net web sites, or else purchase them in printed form at www.bookglobal.net. In the Turkish Islamic Union, no Muslim, Christian or Jew suffers any pain. One is not murdered, injured, gets poor, oppressed, or feels fear. No problem remains in law or justice. No unidentified murders remain. No poverty remains. No lack of productivity remains. No ignorance remains. Every day without any effort for the establishment of the Turkish-Islamic Union is a damage and a loss. The Turkish-Islamic Union must be set up without delay. The entire Turkish nation backs and approves of this excellent union. All the Turkish states and Islamic countries regard the union as essential. They happily and genuinely support it. This union will work to the material and spiritual benefit and well being of America, Russia, China, Europe and the whole world and will bring the world peace, brotherhood, love and well-being. · The Turkish-Islamic Union is the only solution that can put an immediate stop to world terror, disorder, insecurity and the global crisis. Recent developments show that the foundation of the Turkish-Islamic Union, awaited with great excitement and enthusiasm by the Turkish-Islamic world, is close at hand. The first and most important step toward that union will be Azerbaijan and Turkey uniting as two states, but a single nation. In the near future, Turkey, as a super-state, will assume the leadership of the Turkish-Islamic world and unite all Muslims, in a broad expanse of territory from the Caucasus to Tanzania and from Morocco to Fiji, under a single roof. Unity will bestow enormous strength on the Turkish-Islamic world. What truly makes the believers' union so strong is in fact their faith and loyalty. Only genuine faith can engender true friendship and alliance. Muslims love one another with a pure heart and for the good pleasure of Allah, without the slightest selfish interest. A union built on the strongest foundation known to humanity—the fear and love of Allah—will never shatter, unless Allah wills otherwise. The Turkish-Islamic Union will bring peace to the world. The Turkish-Islamic Union will first and foremost resolve the disputes between Muslim countries and bring peace to the Islamic world; it will also oppose all those movements that incite war and conflict in the world as a whole, and will be a force capable of preventing all initiatives aimed at provoking war. It will be a great blessing and comfort for the EU if it is freed from concerns over terror. The Turkish-Islamic Union is the certain solution that can bring this about. With the Turkish-Islamic Union, all the troubles and disorder in the Islamic world can come to an end. By this means, the Turkic states can move to establish a civilization equal to or even greater than Europe. That is because the Turkic states represent a potentially very wealthy region. The Turkish-Islamic Union will bring great wealth, abundance, peace and quality to that region. "There is much information in the hadith of our Prophet (saas) to the effect that the Turkish nation will undertake a very special task in the End Times. Istanbul is much noted in the hadith. The Turkish nation is the best suited, in terms of moral values and nature, to the task, and whoever you may ask is agreed on that. The characteristic of the Turkish nation is this: it is a virtuous and religious one. It has always been the standard-bearer of Islam. Such a nation has the right to be a leader. It will justly discharge that function and be an excellent leader. But this is not a claim of any kind of racial superiority. It is impossible for a Muslim to make such a claim. We are servants of Allah. Superiority lies in taqwa (awe or fear of Allah, which inspires a person to be on guard against wrong action and eager for actions which please Him). Anything else leads to fascism, infertility and evilness. Allah will respond to anyone who thinks like that, and the result will be catastrophic for them. When I talk about a Turkish-Islamic Union under Turkish leadership and supported by the Turkic states, I am referring to the moral values of the Turkish nation. Allah has created this nation to be very excellent and charged it with spreading justice to mankind and the world. It is a natural leader, resistant to suffering, troubles and hunger, loyal, courageous, religious, morally virtuous and honest. Anatolian people are very virtuous. Go to the Black Sea region and you will be amazed at their moral values, or to Anatolia. Go to the South-East and you will be amazed. Words canot describe their hospitality, affection, respect, kindness and honor. You cannot find that anywhere else in the world. To sum up, first, Turkey will undertake this duty as a legacy from the Ottoman Empire. Second, the model of Islam as is lived by in Turkey is an exemplary one. The rational, enlightened and honest conception of Islam in Turkey, warm, tolerant and not at all radical, is of the greatest importance. This is both an excellent example for the Muslim world and also an ideal model that will eliminate all doubts in Western minds. Third, all the sacred and holy relics are in Turkey. Fourth, we are at the center. We are at a key point for connecting the Turkic states and Islamic countries to Europe. We have a very-well educated and enlightened potential and are eager to assume the job. We are highly enthisiastic for it. Nobody else is as keen as us. " The Turkish-Islamic Union will revitalize trade and strengthen the economy. Union among Muslim countries in the economic, political and cultural arenas will permit the less developed to make rapid progress and those countries which already possess the requisite means and infrastructure to use these as efficiently as possible. Economic growth and investment in science and technology will rise. With economic development will come a natural rise in education levels, and society will make progress on a number of fronts. The Turkish-Islamic Union will cause regeneration throughout the Muslim world. Thanks to the Islamic common market to be set up, products from one country will be easily marketed in another, without becoming caught up in quotas or national frontiers. Trade zones will grow, all Muslim countries will enjoy an increase in market share, exports will rise, leading to an acceleration of industrialization in Muslim countries, and economic development will lead to technological advances. With the founding of the Turkish-Islamic Union, energy resources will be guaranteed. Under the Turkish-Islamic Union, peace and stability will prevail in regions with rich underground reserves, and the democratic system will function in a most well-ordered manner there. A model will thus emerge in which these resources are used in the most efficient manner, and neither Islamic countries nor other communities will be disadvantaged. This, in turn, will make stable and balanced political policies possible in those matters of particular importance in maintaining global economic stability, particularly oil production and prices. A Turkish-Islamic world with a powerful economy will be a major cause of prosperity for the Western world and other societies. These societies will find a power with which they can co-operate and engage in mutual trade with no feelings of concern. In addition, the funds that Western institutions and organizations constantly pour in for the region to regenerate will no longer be required, and these funds will be used to strengthen the global economy instead. In that respect, the Turkish nation bears a major responsibility. Turkey’s duty is to lead this Turkish-Islamic world that will bring peace, well-being and abundance to the whole world. The leadership of the Turkish-Islamic world is one of the greatest tasks in the history of the world. THIS IS ONE OF THE TURKISH NATION’S MOST VITAL DUTIES. In other words, our duty as the Turkish nation is not solely to save Turkey, but also to save the whole Turkish-Islamic world and bring peace and well-being to all humanity. The Turkish-Islamic Union is the only solution that can put an immediate stop to world terror, disorder, insecurity and the global crisis. In that respect, the Turkish nation bears a major responsibility. Turkey’s duty is to lead this Turkish-Islamic world that will bring peace, well-being and abundance to the whole world. The leadership of the Turkish-Islamic world is one of the greatest tasks in the history of the world. THIS IS ONE OF THE TURKISH NATION’S MOST VITAL DUTUES. In other words, our duty as the Turkish nation is not solely to save Turkey, but also to save the whole Turkish-Islamic world and bring peace and well-being to all humanity. · The communist deep state society that has infiltrated the Turkish state seeks to divide Turkey into a Communist East Turkey and a Communist West Turkey. But this is a hopeless ambition. Turkey will be the greatest state in the whole of the Middle East and the Balkans. Within the next 10 to 20 years, it will be the leader of the Turkish-Islamic Union that will include such regions as Mosul, Kirkuk, Turkistan, Kazakhstan and Azerbaijan as well as all other Islamic countries. There will never be any fragmentation, but rather unification and unison. Turkey will be the greatest super-state within the next 10 to 20 years. The signs of this have started becoming crystal clear. Turkey possesses a perspective and power, a mission inherited from the Ottoman Empire, that will put an end to such negativities in the region as anarchy, disorder, hunger, poverty, fear and oppression. A state that ran a world empire will again shape the world in the years to come. Realizing this, the communist deep state society was enraged and embarked on a ruthless campaign against Adnan Oktar and Science Research Foundation (BAV), which they regarded as an obstacle to their own vile objectives. Thousands of members of this communist deep state society initiated an intensive campaign against Mr. Oktar and the BAV with new criminal gangs they had established. They seek to achieve their loathsome aims by setting up new gangs as they used to do. This is behavior that further stirs Turkish patriotism and Mr. Oktar and the BAV, and gives them even greater determination in their struggle. They will get absolutely nowhere by these means. Adnan Oktar and the BAV are continuing and will continue their intellectual and cultural activities. This is the information age. Information and culture will annihilate this faithless grouping, by Allah’s leave. · The public are closely watching certain recent initiatives seeking to use the threat of terror in order to force the state to compromise with the separatist terrorist organization. First and foremost it needs to be known that it is impossible for the Republic of Turkey to negotiate with baby killers. · People from the East of Turkey possess excellent and exemplary moral values. They are well-mannered, good humored, determined and humane people, strongly loyal to the state. They are so hospitable as to offer guests their best food and accommodation, and are loyal and full of love. The majority of the people of Anatolia possess a most superior character. The scourge of terror must be lifted from our brothers of Kurdish origin in the eastern regions of the country, and the road to happiness must be opened up for these people, from whom great heroes and great scholars have emerged. Our Kurdish citizens now wish to be freed from the scourge of terror. That is why anyone regarding themselves as representatives of the people of the region must first strive for terror to be eradicated. · Terror is not the way for the people of the region to attain peace and well-being. It is Muslim Turks, not communists, who will bring the region the desired standard of living. All the terrorist organization has ever brought with it is fear and blood. Tens of billions of dollars that could have been spent on the well-being of the people of the East have been wasted because of that organization. The organization militants who have striven to obstruct whatever means the state has adopted to regenerate the region will be unable to deceive the people any longer with the lie that they desire their well-being. The Turkish people have now realized that once that organization has been eliminated the East can become the greatest economic and attractive cultural center of Turkey. The separatist terrorist organization is a communist one in its every action, every slogan and every statement. Most of the people of eastern Turkey are religious, however. For that reason, their realizing the separatist organization’s true aims and its atheistic structure will be instrumental in its eradication. We are looking at a communist and atheistic movement, and not at an ethnic one. The Science Research Foundation (BAV) community actively combats all forms of separatist movement in Turkey, and has for years been subjected to various forms of pressure, threats and slanders. The reason for this is the historic mission the BAV has assumed in neutralizing the tactical ruses employed in the country. Some sinister forces are trying to do away with the BAV. One communist criminal gang in particular, that has infiltrated and installed itself inside the state, has embarked upon an intense smear campaign that has made its action totally disgraceful and shameless. The leader of the separatist organization has seen the success of the ideas espoused by Adnan Oktar in the analysis and rectification of events, and of the harm they will do to his outfit, and therefore has no compunction about slandering him. To date, the author has written around 250 books, for a total of 46,000 pages, and containing some 31,500 illustrations. Some 7,000 of these pages – and 6,000 of the illustrations – deal with the collapse of the theory of evolution. www.harunyahya.com, and www.harunyahya.net. Or else you can order them in printed form at www.bookglobal.net. - Harun Yahya espouses the scientific view, one of the fundamental values of the Republic. Pro-Darwinist publications, on the other hand, espouse the nonsense of evolution, a mass deception that has taken in the whole world. - Darwinism is a pagan religion, an idolatrous belief; it is not science. All the findings in the fields of biology, medicine, paleontology, microbiology and genetics have refuted and demolished evolution. It is therefore dishonest to attempt to dress this nonsense up in scientific clothing and thus mislead the public. - Evolution is a dogma, whereas Creation is a fact. The imposition of this dogma, the attempt to force people to accept a perversion that has survived ever since Sumerian times and official pressure using legal means in order to ensure that is a total violation of science, human rights and realistic thinking. - The fact that the Church of England has apologized to Darwin is not, contrary to what people might think, a measure in favor of evolution. We know that the Church of England behaved in a bigoted manner on all subjects at that time. For years the Church treated all proposition, scientific or nonsensical, in a bigoted way. For that reason, the Church also treated the nonsense of evolution in the same way in the 19th century. By apologizing, the Church is merely trying to make up for all the bigotry of the past. o And for deceiving all of humanity, admitting a biased lie and nonsense, and violating the human rights of all mankind by disseminating that nonsense. - Darwinist publications constantly talk about freedom of expression and democracy. But they support the banning by the Council of Europe of the Atlas of Creation, which is full of scientific evidence and has caused such a wide response across the world, and do all in their power to bring it about. Yet they oppose the banning by court decision of Richard Dawkins’ insult-filled book and articles. This is nothing more than dishonesty. - It should be remembered that all these books and articles, written as objections to Harun Yahya’s Atlas of Creation have all served to introduce it to a wide public. All these efforts have led to the scientific evidence in the Atlas being examined in greater detail and to open discussion of its striking aspects. In addition, the publications in question have always exposed the weakness of the Darwinist defense. This feeble defense in the face of the strong scientific evidence in the Atlas of Creation is one of the main indications of how the theory has collapsed and vanished. - The hollowness and illogicality of the evidence cited in Darwinist publications, and the way that Darwinists resort to utter nonsense in order to defend their positions, have led even more people to conclude that evolution is a lie. It is sufficient to read publications critical of the Atlas of Creation to see the invalidity of Darwinism. In these terms again, Harun Yahya is clearly having a global impact. An Anti-Darwinist Bombardment: An international campaign against the theory of evolution has hit Denmark. As he himself says, Harun Yahya has obtained good results from his campaign, which is now apparently about to conquer Europe. How is it that Darwinism has come to such dire straits if it was so powerful? How has this lie, that Darwinists have persisted in maintaining for the last 150 years, been demolished in just 150 days? How did this false theory that deceived the whole world for so many years come to be obliterated by a single blow from Harun Yahya? Why have countries in Europe and America begun speaking of the total collapse and annihilation of Darwinism and, albeit reluctantly, admitting this reality? The reason is that the Atlas of Creation has had an explosive impact on the world and has obliterated a terrible lie, using absolute and irrefutable scientific evidence. Both Turkey and the rest of the world have admitted that the theory of evolution has collapsed in the face of the Atlas of Creation. Darwinist impositions can no longer produce any results. Today and in the future, all actions taken against publications opposed to Darwinism and other pitiful actions taken will always lead people to turn even more to the Atlas of Creation and to ever wider acceptance of the fact of Creation. ]]>http://secretbeyondmatter.com/en/Announcements/9653/a-statement-to-darwinistshttp://secretbeyondmatter.com/en/Announcements/9653/a-statement-to-darwinistsFri, 10 Oct 2008 14:15:31 +0300The Turkish-Islamic Union is the Solution to the 'East Turkestan Question' Muslims are living under difficult circumstances in various regions of the world. The people of East Turkestan in the extreme West of China, for instance, have been exposed to severe repression for the last 50 years in particular. Life in East Turkestan, the majority of whose population are Uighurs, is far more troubled than any other region of China. The number of people killed in East Turkestan together with post-1965 massacres is the unbelievable figure of 35 million. Occupation, repression and sanctions have brought the region nothing but tension, disorder and hatred. The days of exploiting nations by such means are dead and gone. For that reason, if China permits the people of East Turkestan to govern themselves and grants the country economic independence it will gain enormous advantages. An East Turkestan able to manufacture freely within its own borders, living in freedom and freed from the influence of fear and oppression, can represent a new center of progress for China. These rights can be given to the people of East Turkestan thanks to the Turkish-Islamic Union, which will enjoy great power and authority. If such a power acts as guarantor, China’s relations with the millions of Muslims in the country will be strengthened. China must be convinced and given guarantees that an East Turkestan that is emotionally bound to the Turkish-Islamic Union will not behave in a hostile manner toward China but will contribute to China’s becoming a super-power. The world needs peace, love, solidarity and justice. And that is the mission that the Turkish-Islamic Union will assume when it is set up. This union will exist to bring peace to the world, not to be an instrument of hostility, vengeance or menace. This union will not be one based on oppression and repression along the lines of “everyone must be subjects to us, and anyone who does not must be enslaved.” The Turkish-Islamic Union is a union of love and understanding. By means of this union, members of all faiths will be able to worship as they wish, to visit all the sacred sites of their faith, and their goods, lives and honor will be guaranteed by the Turkish-Islamic Union. Contrary to the scenarios of clash of civilizations, this union will draw civilizations closer to one another. As a result, the whole world will benefit from the climate the union will bring about. The foundations of the union are love, affection, compassion, altruism and solidarity. In addition, it also aims to elevate humanity to the highest levels of respect for human beings, art, science and technology. The Turkish-Islamic Union, which represents a population of around 1 billion spread over a very wide area and will knit all its individual components together, will constitute a large economic market. This, in turns, means a wide-ranging commercial opportunity especially for China. This must therefore be very carefully explained to it. Terrorist activities in the Turkish-Islamic zone will be totally eradicated, and those who incite terrorism will find themselves confronted by the highly deterrent army of the Turkish-Islamic Union military pact. The unitary structures of the states comprising the union will be maintained. Secularism will be one of the fundamental principles of the union. For that reason, both Muslims and non-Muslims will be able to live in security under the same strong roof. The Turkish-Islamic Union also represents a major opportunity to resolve the disputes regarding Israel and Palestine. Today the peoples of Israel and Palestine are forced to live uneasily behind walls in order to maintain their own security. When the Turkish-Islamic Union is established there will be no need to build walls stretching for many kilometers, nor for any other precautionary measures. The foundation of the Turkish-Islamic Union is being awaited with the greatest enthusiasm and excitement by the entire Turkish and Islamic world. ]]>http://secretbeyondmatter.com/en/Announcements/9606/the-turkish-islamic-union-ishttp://secretbeyondmatter.com/en/Announcements/9606/the-turkish-islamic-union-isSat, 04 Oct 2008 23:57:47 +0300The Global Darwinist Dictatorship Must Apologize to the Entire World! And for so long teaching students in all schools and universities the deception that “chance causes evolution” AS A SCIENTIFIC FACT. In short, the Global Darwinist dictatorship MUST APOLOGIZE FOR DECEIVING THE WHOLE WORLD WITH THESE BLATANT UNTRUTHS FOR THE LAST 150 YEARS. Beside all these Darwinist falsehoods, there are many professors around the world removed from their posts, as dictated by Darwinist imposition, just because they espouse the fact of Creation. Most recently, Michael Reiss, director of education of the Royal Society, was swiftly removed from his post in the wake of his suggestionthat Creation also be taught in schools. PROFESSORS AND ACADEMIC STAFF WHO HAVE BEEN REMOVED FROM THEIR POSTS because they espouse Creationism SHOULD BE RESTORED TO OFFICE. STUDENTS WHO HAVE BEEN FORCED TO LEAVE SCHOOL AND END THEIR EDUCATION because they answered “I do not accept this claim” when asked about Darwinism in exams SHOULD BE RETURNED TO THEIR SCHOOLS. The fossil record is perhaps the most important evidence that demolishes the theory of evolution's claims. Fossils reveal that life forms on Earth have never undergone even the slightest change and have never developed into one another. Examining the fossil record, we see that living things are exactly the same today as they were hundreds of millions of years ago—in other words, that they never underwent evolution. Even during the most ancient periods, life forms emerged suddenly with all their complex structures–with the perfect and superior features, just as do their counterparts today. This demonstrates one indisputable fact: Living things did not come into being through the imaginary processes of evolution. All the living things that have ever existed on Earth were created by God. This fact of creation is once again revealed in the traces left behind them by flawless living things. The time has come for the Turkish-Islamic world to unite. There is no reason why these communities, with a common religion, language, customs, heritage and tradition, should not unite and act as one. The unification of Turkic-Islamic societies, which generally speak the same language, which believe in the one God, which sincerely submit to our Prophet (saas) and love him with a profound respect, and which share the Islamic moral values of hospitality, love, loyalty, humility, sincerity, its entire essence, will come as a great blessing. The current division between these nations is exceedingly artificial and unnecessary. When the Turkish-Islamic world, which stretches over a wide expanse of land from the Caucasus to Tanzania and from Morocco to Fiji, acts as one it will, Allah willing, arise gloriously anew. The establishment of the Turkish-Islamic Union is essential if the bloodshed in the world is to stop, for anarchy and terror to come to an end, if peace and abundance are to prevail, for the Muslim world to attain security and for world peace. · The secular structure of the Turkish-Islamic Union will protect both believers and unbelievers, and people of all ideologies and beliefs. Not only Muslims will be able to worship and live freely as they wish under the umbrella of this union based on the principles of secularism, democracy and the supremacy of the law, but also Jews and Christians. Not only believers, but also Buddhists, atheists, agnostics and materialists, in short everyone, will be free to express their opinions and live as they choose in the climate of freedom established under the Turkish-Islamic Union. The Turkish-Islamic Union will regard everyone, no matter what their beliefs, opinions, race or nation, as first-class citizens, and will constitute a social role model with its democratic and secular structure that attaches the proper value to human rights and fundamental liberties. · The Turkish-Islamic Union is a moderate union. It will be a union based on respect for human beings, based on tolerance and compassion, open-minded and free-thinking, a union of brotherhood and love, rather than one of fanaticism, repression and subjugation. It will establish security for those nations uniting under it and to the other nations of the world. It will be a most excellent thing for the Turkish-Islamic world to have such a rational, reasonable and just leadership, not just for the 1.5 billion or so Muslims who currently face so many difficulties, but also for everyone else in the world. Ever since the time of the Prophet Muhammad (saas), Muslims have led the way in such fields as reason, science, philosophy, art, culture and civilization, and have produced stupendous works for the “good of all humanity.” It is the Turkish-Islamic Union that will lead the way to the 21st century being an age of real enlightenment. · The enlightenment brought about by the Turkish-Islamic Union will greatly benefit the entire world. The USA, Russia, China, Israel and all the states of Europe will see that deep-rooted problems that have persisted for many years have suddenly been resolved with the foundation of the Turkish-Islamic Union, which will be of benefit to everyone. All concerns regarding the security, economies and cultural values of the great powers lying outside the Turkish-Islamic Union will disappear once that union has been established. The war against terror will come to an end, cultural conflict will be completely eradicated, it will be possible for underground resources to be used in the best manner by everyone, there will be economic stability and the possibility of crisis will be eliminated, and funds currently diverted to military expenditure will be spent on a high-quality and more secure life for all. A powerful Turkish-Islamic Union is obviously in the interests of all. · The Turkish-Islamic world is going through a time of maturation. The troubles that have persisted for more than 100 years, from the late 19th century to the present day, have raised the consciousness of and strengthened the Turkish-Islamic world. The moral values of the true faith have spread gloriously across this expanse of land. There now exists a mass of people, and the younger generation in particular, who are mature and aware, and purged of all fanaticism. It is evident that we now have an ideal foundation for the unification of the Turkish-Islamic world that is so excitedly and joyfully anticipated. It is essential that proper advantage be taken of this climate and that the requisite steps be taken forthwith. Darwinism has deceived the world for around a century and a half and has attempted to indoctrinate people with materialist philosophy using hoaxes and lies. HARUN YAHYA’S ATLAS OF CREATION HAS ANNOUNCED THE DEMOLITION OF THIS FALSE THEORY, which for years convinced people that life forms were descended, by chance, from other forms. The Turkish public came to see this reality with enormous joy and excitement, following which and by virtue of Atlas of Creation, the people of Europe who had for so long been subjected to materialist and Darwinist indoctrination, also came by the opportunity of seeing the true facts. The way that all of Europe has become acquainted with Atlas of Creation and the declaration of the fact that living creatures have remained unchanged for millions of years and that evolution is devoid of any scientific worth have led to a major change of belief among the people of Europe. Independent polls conducted by well-known publishing institutions in different European countries have revealed a major drop in the numbers of people believing in Darwinism and that belief in Allah now dominates Europe. Following the major impact of the distribution of Atlas of Creation in France, the French website Science Actualités carried out a public opinion poll. The results of the survey showed that Darwinism has been annihilated in France. According to the findings, set out under the caption “Your Views on Evolution,” revealed that 92% of the public no longer believe in evolution. The Danish People No Longer Believe in Evolution. According to a poll in Germany, the public no longer believe in evolution. The findings appeared under the caption “Evolution – no, thanks?”. The level of people believing in the fact of Creation stood at 85% in a poll conducted on the web site of Blick, one of Switzerland’s widest-read newspapers. What the findings of the polls, a few of which are cited above, make crystal clear is this: ATLAS OF CREATION HAS HAD AN EXPLOSIVE IMPACT ON THE ENTIRE WORLD. In the face of the scientific evidence people have now abandoned belief in the fraud of evolution. They now realize that Darwinism is a deception being kept alive for ideological reasons. In the wake of the facts set out in Atlas of Creation, people have now come to see that all living creatures are brought into being by the will and at the command of our Lord, Allah. That is what the poll results show. DARWINISM HAS BEEN ANNIHILATED AND DEMOLISHED ACROSS THE WHOLE WORLD, BEFORE THE VERY EYES OF THE LOYAL ADHERENTS OF MATERIALIST PHILOSOPHY. According to a poll regarding whether or not evolution actually happened that appeared on the web site of Süddeutsche Zeitung, one of Germany’s main dailies, the level of those believing that human beings are the work of a Creator stands at 87%. There can be no materialism without Darwinism, and without materialism there can be no communism, and without communism there can be no terrorism. They are systems that give birth to one another. In order to bar the way to terror, therefore, the way to Darwinism must first be barred. Darwinist, materialist and godless militants raised by the PKK show their hostility towards Allah (God) and Islam by mocking the call to prayer and the prayer itself. The only way to oppose the ideology of this separatist organization is with cultural, scientific, anti-Darwinist and anti-materialist knowledge. It is the Turkish nation itself that will eliminate separatist terror and cut off its lifeblood. What needs to be done is to initiate a determined and powerful intellectual struggle against the materialist-Darwinist religion to which the organization adheres. If that faith can be eradicated by scientific means, the soul of terror will die. When there is no Darwinism, the communist-separatist movement will also disappear. One must not forget that ideas are the most powerful weapons against separatist terrorism. - Europe’s common denominator today is dialectical materialism and Darwinism. All parties in Europe – Communists, Socialists, Christian Democrats, Greens and the rest – share the view of life and the world foreseen by Darwinism. Many parties currently in power or preparing to share power have declared their support for atheism rooted in Darwinism. Europe is under the influence of that perspective. - Even the great majority of the clergy in Europe have undergone and been made passive by a Darwinist education. Opinion polls show that some 75-80% of Europeans reject belief in Allah and support Darwinism. - Europe backs, both openly and in secret, the separatist terrorist organization that is, like itself, built on Darwinist and materialist foundations, supplying it with logistical support and keeping it alive. It would therefore be nonsensical to expect support from Europe in eradicating the separatist terror. Islamic countries, on the other hand, lack the means with which to do so. - In following the path of a worn-out and exhausted materialism, Europe is heading towards death. It has fallen into the swamp of materialism, and the only power that can extract it is the Turkish nation. By the will of Allah, the Turkish nation will teach it human feelings, love, compassion, loyalty and solidarity, and be a means whereby the world enters upon a new age. Darwinists come up with a new false claim in the face of every piece of evidence they see spelling the collapse of Darwinism. They either produce a new fossil skull, or say that an intermediate form fossil has been discovered, or else claim they have proven a close similarity between human and chimpanzee genes. They even announce that they have produced a cell or chromosome. The fact is that these are all lies. There is not one single fossil that supports Darwinism. Not a single intermediate form fossil has ever been found in any excavations. No cell has ever been produced in the laboratory. The chromosome scientists claimed to have manufactured was actually synthesized from the chromosome of a pre-existing organism. In addition, that research was carried out with the help of technical equipment developed by hundreds of scientists and engineers, in a planned manner. To put it another way, this was no chance production. That definitively demolishes Darwinism. The important thing is that this artificial chromosome did not come into existence by chance, there is a Creator behind it. The probability of a human protein coming into existence by chance is 1 in 10950, in other words, zero. Even if that protein were manufactured, considerable effort would need to be expended. Giving it life, on the other hand, is something different. There are cells and chromosomes in a dead human body in the morgue, but the body is lifeless. It is the soul bestowed by Allah that gives the body life. COMMUNIST LEADERS WHO ADOPTED DARWINIST VIEWS REGARDED MAN AS AN ANIMAL, AND USED TERROR, SLAUGHTER AND BLOODSHED AS ESSENTIAL TOOLS. THE COMMUNIST TERROR ROOTED IN DARWINISM IS NOT RESTRICTED TO THE SOUTH-EAST OF TURKEY. ALL OF TURKEY AND THE MIDDLE EAST FACE THE THREAT OF COMMUNIST TAKE-OVER, AND THAT IS THE INTENDED OBJECTIVE. IT MUST NOT BE FORGOTTEN THAT "COMMUNISM HAS NO COUNTRY. THE WHOLE WORLD IS THE COMMUNIST’S NATION." Separatist militants raised in the light of Marxist-Leninist ideas and Lenin’s terror directives, themselves rooted in Darwinism, slaughter Turkish police officers, soldiers and innocent civilians and resort to all forms of terrorism. One cannot expect people who hold Darwinist-Marxist views in Europe and elsewhere to oppose terror. That would be a violation of the spirit and logic of Marxist philosophy. Messages of condemnation mean nothing to such people. Darwinist-Marxists regard terrorists as “revolutionary forces fighting against feudalism.” Terrorists revere the memories of such shedders of blood as Ho Chi Minh. The Vietnamese guerrilla leader Ho Chi Minh (1890-1969) was a dyed-in-the-wool Marxist-Leninist and Darwinist. The guerrilla techniques employed by the separatist communist organization in the south-east of Turkey are all those implemented by that rabid communist. The first volume of Harun Yahya’s Atlas of Creation was initially printed in English and then in French. The sending of the book to the best known figures and many centers of education has caused a major culture shock in Europe, and in France particularly, which has to date disregarded any view against its many perverted views and philosophies and declined to regard them as a threat. Newspapers and magazines have referred to Atlas of Creation, which was distributed to specific circles and in specific numbers, in terms of “a flood,” a “tornado,” “an earthquake,” “the greatest defeat in French history” and “panic.” Those are the kind of expressions that have been used to describe the defeat and wretchedness of Darwinism. Thousands of reports concerning Atlas of Creation have appeared in hundreds of newspapers, magazines and web sites. These include many of the best-known publications in the world, such as The Washington Post, Le Figaro, Le Monde, La Liberation, Yves Daoudal and L’Express. It is obvious that people with a Darwinist, materialist and atheist mindset, such as the Luxemburg parliamentarian Anne Brasseur, cannot halt the facts of science through pressure and book-burning. Darwinism is not scientific, rather it is a deception. The panic caused by the demolition of Darwinism has rocked all of Europe. This panic is still going on in waves. Some European parliamentarians have panicked on realizing that Darwinism is about to be culturally and scientifically obliterated. That is because when there is no Darwinism, communism will also disappear, and in the absence of communism, separatist terrorism will disappear, and without separatist terror the plans to split Turkey up will come to nothing. This is a chain. When the top link is broken, this treasonable plan will also be broken. That is the reason for the panic among some pro-communist European parliamentarians. The 764-page Atlas of Creation, unique in the world at 28 by 38 centimeters in size and printed with outstanding technical quality, illustrates hundreds of fossils, each of which refutes the theory of evolution and contains the most conclusive information regarding Darwinism’s collapse. With the original hologram images on its cover, some 1,500 full-color illustrations and photographs on glossy paper, the book is superb in its physical appearance. Moreover, with this substantial work comes the VCD documentary Fossils Have Discredited Evolution . . In Order To See What A Deception the Theory of Evolution Really Is, You Must Read These Books by Harun Yahya (Adnan Oktar)! Under the pen-name of Harun Yahya, Adnan Oktar has written around 250 books, for a total of 46,000 pages, and containing some 31,500 illustrations. Some 7,000 of these pages – and 6,000 of the illustrations – deal with the collapse of the Theory of Evolution. You can read the books by Adnan Oktar (writing under the pen-name of Harun Yahya) free of charge on the following websites: www.harunyahya.com, and www.harunyahya.net. Or else you can order them in printed form at www.bookglobal.net. · The Turkish-Islamic Union is a union of love. It is a union of affection, a union of hearts. The basis of this union are love, altruism, helping others, compassion, tolerance and understanding. The aim of the union is also to achieve the highest levels in respect for human beings and in art, science and technology. Once the union is established, not just Turkish societies and Muslims, but the whole world, will attain enlightenment. · What truly makes the believers' union so strong is their faith and loyalty. Only genuine faith can engender true friendship and alliance. Muslims love one another with a pure heart and for the good pleasure of Allah, without the slightest selfish interest. A union built on the strongest foundation known to humanity—the fear and love of Allah—will never shatter, unless Allah wills otherwise. · The Turkish-Islamic Union will bring peace to the world. The Turkish-Islamic Union will first and foremost resolve the disputes between Muslim countries and bring peace to the Islamic world; it will also oppose all those movements that incite war and conflict in the world as a whole, and will be a force capable of preventing all initiatives aimed at provoking war. · With the founding of the Turkish-Islamic Union, America, Europe, China, Russia, Israel and in short the whole world will breathe easier. Terror will come to an end, distribution of raw materials will be guaranteed, the economic and social order will be protected and cultural conflicts will disappear entirely. America will no longer have to send troops to lands thousands of kilometers away, Israel will no longer live behind walls, the countries of the EU will encounter no economic barriers, Russia will have no more security concerns and China will have no trouble finding raw materials. · With the founding of the Turkish-Islamic Union, the West’s defense spending will fall. With its $400 billion military budget, the United States of America heads the armament list. Russia follows the USA with $60 billion, and China follows Russia with $42 billion. The Turkish-Islamic Union will give rise to a climate of global peace and security by eradicating all conflict and tensions regarding the Islamic world, and will also lead to a reduction in military spending, not just in Muslim countries, but on the part of a great many countries of the world. Investment in arms technology and money spent on weapons development will thus be diverted to such spheres as education, medicine, science and culture. · Freedom of ideas and expression are inherent in the Turkish-Islamic Union. People holding all kinds of beliefs and views will be able to express their ideas free from pressure and obstruction. These people’s rights will be protected by all means and everyone’s ideas will be met with toleration. Under the leadership of the Turkish-Islamic Union, Muslim societies will be communities in which people respect one another’s views, communities will be dominated by equality, justice and freedom, and oppression and injustice will be banished. The Islamic world will not bring peace and security to Muslims alone, but will play a leading role in global culture and civilization. · The Turkish-Islamic Union will revitalize trade and strengthen the economy. Union among Muslim countries in the economic, political and cultural arenas will permit the less developed to make rapid progress and those countries which already possess the requisite means and infrastructure to use these as efficiently as possible. Economic growth and investment in science and technology will rise. With economic development will come a natural rise in education levels, and society will make progress on a number of fronts. · The Turkish-Islamic Union will cause regeneration throughout the Muslim world. Thanks to the Islamic common market to be set up, products from one country will be easily marketed in another, without becoming caught up in quotas or national frontiers. Trade zones will grow, all Muslim countries will enjoy an increase in market share, exports will rise, leading to an acceleration of industrialization in Muslim countries, and economic development will lead to technological advances. · A Turkic-Islamic world with a powerful economy will be a major cause of prosperity for the Western world and other societies. These societies will find a power with which they can co-operate and engage in mutual trade with no feelings of concern. In addition, the funds that Western institutions and organizations constantly pour in for the region to regenerate will no longer be required, and these funds will be used to strengthen the global economy instead. · With the founding of the Turkish-Islamic Union, energy resources will be guaranteed. Under the Turkish-Islamic Union, peace and stability will prevail in regions with rich underground reserves, and the democratic system will function in a most well-ordered manner there. A model will thus emerge in which these resources are used in the most efficient manner, and neither Islamic countries nor other communities will be disadvantaged. This, in turn, will make stable and balanced political policies possible in those matters of particular importance in maintaining global economic stability, particularly oil production and prices. · The Turkish-Islamic Union will encourage art and build a magnificent civilization. Peace and security will take hold, economic problems will be resolved in the Turkic-Islamic world, and a massive cultural advancement will take place, for there will be growing budgets for education, science, and culture. As friendship and fraternal feelings will prosper, people will find more time to reflect and conduct research, and they will be more free-thinking and open-minded when they do so. Environments free of chaos, destitution, and troubles are places in which new ideas take shape, new products emerge, beneficial inventions are made, and continuing progress is achieved. The Turkish-Islamic Union will create such an environment throughout the Islamic world. - The foundation of the Turkish-Islamic Union is being anticipated with great enthusiasm and excitement by the whole Islamic and Turkic world. The first and most important step towards that union is the unification of Turkey and Azerbaijan as two states but a single nation. That union must be based on the maintenance of the unitary structure of both states. There must be an end to passport and visa formalities and trade must be made easier. A more powerful military alliance must be established between Turkey and Azerbaijan with the formation of a Turkish-Azeri military pact. This unification, the first phase of the Turkish-Islamic Union, must be realized as a matter of urgency, with no loss of time and no further delay. - We must ensure that tragedies such as the recent Hocali Massacre are never repeated. And the Lachin Corridor, invaded and closed in 1992, must be opened up for peace and security to return to these lands. The Nagorno-Karabakh region must be freed from occupation. All kinds of diplomatic initiative must be taken to have the Lachin Corridor opened. - Raising tension and constantly inciting feelings of enmity is in no-one’s interest. Our age is one of friendship, love, understanding and co-operation, not of anger and hatred. The days of anger and vengeance are over. Armenia must adopt a brotherly and friendly stance, and emphasize love and peace instead of hostility. It must abandon the concept of “hostility to the Turks.” These feelings of enmity are incompatible with contemporary social norms. Living in this manner has to date been of no economic or cultural advantage to Armenia. If the politics of enmity persist, Armenia’s current economic circumstances will worsen still further, and poverty and want will rise. The way to a bright and prosperous Armenia lies in brotherhood and love. - Armenians are also a people of the Book. Muslims’ attitudes towards the People of the Book are made crystal clear in the Qur’an. Our Prophet (saas) always treated the Peoples of the Book with tolerance and compassion. Throughout the Seljuk and Ottoman empires, the Armenians enjoyed a well-being and security they never found anywhere else. The Ottomans referred to the Armenians as the Millet-i Sidika (The Trustworthy Nation). However, the Armenians must free themselves from feelings of anger and hatred rooted in the past. It is essential they adopt a reconciliatory attitude. That is what their faith also demands of them. Many passages in the Bible emphasize the special importance of loving one’s neighbor and even say that believers must do all they can for the good of their neighbors. The Armenians must adopt love and compassion as the basis of their policies towards their neighbors, as they are told in the Bible. - If Armenia behaves in a friendly and brotherly manner, and if it sets aside everything left over from the past, then commercial and cultural relations with Armenia can be established. Armenia will obviously benefit from a climate of friendship resulting from Azerbaijan and Turkey uniting together. Economic, political and commercial union will benefit all parties, and a region enjoying great well-being will emerge under those conditions. Armenians will enjoy greater freedom and security in commerce, and in their religion, language and their life styles. The constant tension in the area will thus be replaced by peace. That peace will obviously be to the advantage of all involved. - What needs to be done today is to forget the past and look to the future. Instead of talking about what happened in the past the whole time, we should talk about what can be done in the future, how economic conditions in the region can be improved, what cultural steps can be taken, how stability can be established and how all disputes can be eliminated. That is what we must concentrate on. There is no point in bringing up the past and raising tensions again. Violence, tension and fanaticism are of no benefit to any society. The most rational and logical way of achieving a solution is to avoid violence of all kinds, to choose moderation over extremism, to behave in a moderate, tolerant and patient manner, and to resolve any problems that may arise through negotiation.